White nationalists clash with counter protesters in Charlottesville. 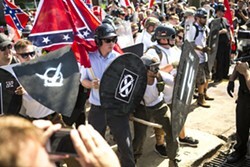 It was with a deepening sense of horror that we watched the events in Charlottesville, Virginia, unfold last weekend, giving generations-old images of hate and violence new 21st century life. The torches. The robes. The Confederate and Nazi flags. The eyes filled with hate and the tongues spitting bigotry. Billy clubs, helmets and shields. Premeditated violence. Then, finally, the gut punch: broken glass, bodies flying, blood and empty shoes on the pavement. Soon after came the feel-good hashtag, #ThisIsNotUs, a social media platitude to distance ourselves from the horror, allowing us to go back to our lives. We're sorry to say it's not that simple, and sorrier to say that this is absolutely us. It may not be you or me carrying torches or driving that car into the crowd, but this is us, collectively, as a nation. And it always has been. It's impossible to understand this moment in time without openly acknowledging that the soil of this great nation is steeped in the blood of brown and black people, our cities and national wealth erected with the machinery of systemic, government-sanctioned genocide, human trafficking and slavery. And these weren't moments of original sin, as our former president so eloquently dubbed them, but prevailing cultures that held — and still hold — that some people are intrinsically more valuable than others. Despite hallowed words on a parchment signed 200 years ago, discrimination, fear and hatred have continued to define this nation. It was only 50 years ago that federal action untied the web of local Jim Crow laws in the South, the legacies of which are still visible to this day. So make no mistake, the violence we saw unfold in Charlottesville this past weekend is woven into the fabric of this nation, stretching back to early colonials massacring Natives and those first slave ships reaching our Atlantic shores in the early 1600s. Fortunately, voices for love, equality and inclusion are also threads in that fabric, and generations of people of color of have bravely and unflinchingly challenged this nation to live up to the lofty ideals Thomas Jefferson — himself a slave owner — enshrined in this nation's founding document, penning the "self-evident" truth that "all men are created equal." But their work is far from finished and forever on slippery footing, as history teaches us the road to true equality isn't straight. After all, German Quakers near Philadelphia wrote a petition calling for the abolition of slavery in 1688 — almost a century before 39 delegates would sign the Constitution, which allowed slavery to continue and essentially ascribed blacks three-fifths the value of their white counterparts. The bloodiest war in American history brought slavery to an end, only to see sharecropping and Jim Crow take its place. When the U.S. Supreme Court decided in 1954 that school segregation was antithetical to our Constitution, it took a decade — and the National Guard — to enforce the ruling. This is us. The realities of life in America for religious minorities and people of color have often run counter to our national aspirations, to who and what we want and profess to be. Nonetheless, scores of social movements have incrementally pushed the needle to the point that some of us here on the North Coast can see torches, hoods and racially motivated violence in far-away Virginia and declare, "This is not us." But what we saw in Charlottesville over the weekend is just the latest battle in a centuries-old war for America's soul. It laid bare that we haven't made the progress many have claimed or felt because we still live in a culture where some will light torches while loudly, publicly proclaiming their inherent value is greater than that of people who don't look like them. So what do we do about this? It's simple. We fight. Or rather, we keep fighting and we stand up to be counted. Here in Humboldt County, where hundreds of people of all hues encircled Arcata City Hall in protest just a few months back to say they don't feel safe in this community, that means condemning hate speech, ignorance and bigotry loudly and unequivocally when and where you hear it, whether that be a public space or a friend's living room. If you are white, it means having uncomfortable conversations with relatives, neighbors and people you love. It means not leaving this work to people of color, religious minorities and LGBTQ folks. It means understanding that the fear people of color feel in this community is real and likely growing after the sight of Sieg Heil salutes, burning torches and Klansmen's robes unabashedly descending on Charlottesville. We are entering a critical juncture in this centuries-old fight, one where hate groups feel confident enough to shed the hoods of the past. In the aftermath of Charlottesville, the neo-Nazi website the Daily Stormer issued a chilling call to arms. "And to everyone, know this: We are now at war," it stated. "And we are not going to back down. ... We are going to go bigger than Charlottesville. We are going to go huge. We are going to take over the country. ... We learned a lot today. And we are going to remember what we learned. This has only just begun." They are right about one thing: We are at war. But to be clear, it's not a war that will be won with violence — if that were the case, it would have ended when the Confederate flag fell in 1865 or when allied forces toppled Nazi Germany in 1945. And it is not a war that will be won in the halls of Congress or at a desk in the White House, where the Voting Rights Act was signed into law more than 50 years ago. Instead, this is a fight that will be won a day at a time, at dinner tables, local meeting halls and on the streets of our communities. It's a war that will play out in our hearts and minds — in our neighborhoods, schools, kitchens and coffee shops. And we need to remember that the fight is much closer than we might like. Those torch-wielding bigots descended on Virginia from all over the country, from Berkeley to New York. And as we write this, white nationalist groups are planning rallies later this month in the Bay Area. This war is destined to continue on until the Richard Spencers, David Dukes and Jason Kesslers of our country are marginalized and ostracized, left to crawl back into the holes from which they came, and their ilk realize there's no refuge for hate speech in a public place. So on behalf of Humboldt County: White supremacists/white nationalists/Nazis, your ideology, your hate speech and your flags are not welcome here. Martin Luther King Jr. once said — and our former president was fond of repeating — that the "arc of the moral universe is long, but it bends toward justice." That's true, but it's also true that history tells us that arc only bends when pushed by regular people. People like you. Editor's note: This story was updated from a previous version to correct errors regarding who signed the U.S. Constitution and where the Civil Rights Act was signed into law. The Journal regrets the errors. Jennifer Fumiko Cahill is the arts and features editor at the Journal. Reach her at 442-1400, extension 320, or Jennifer@northcoastjournal.com. Follow her on Twitter @JFumikoCahill. Thadeus Greenson is the Journal's news editor. Reach him at 442-1400, extension 321, or thad@northcoastjournal.com. Follow him on Twitter @thadeusgreenson.